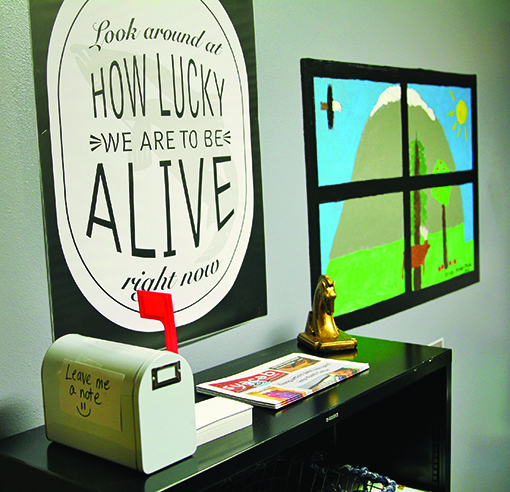 Tulalip Youth Services celebrated “Say Hello Week” with an added focus of taking the stigma out of mental health awareness. The week included a variety of learning activities for the children and teenagers of the community. The biggest event was without a doubt the open house and grand opening of the C.R.E.A.T.E. Space on Friday, February 2. From 10:00am-6:30pm on that Friday, the 2nd floor of the Youth Center was a destination for celebration and hands-on learning while becoming acquainted with the newly created space designed for inclusion, offering a place for community youth to go when they need to decompress. C.R.E.A.T.E. Space stands for Calm Room & Expressive Art to Empower. It’s the result of a collaborative effort of the Methamphetamine Suicide Prevention Initiative through Behavioral Health and Youth Services. All community members and youth are invited to visit the space and learn more about its uses and how to remove the stigma and shame surrounding mental health issues. 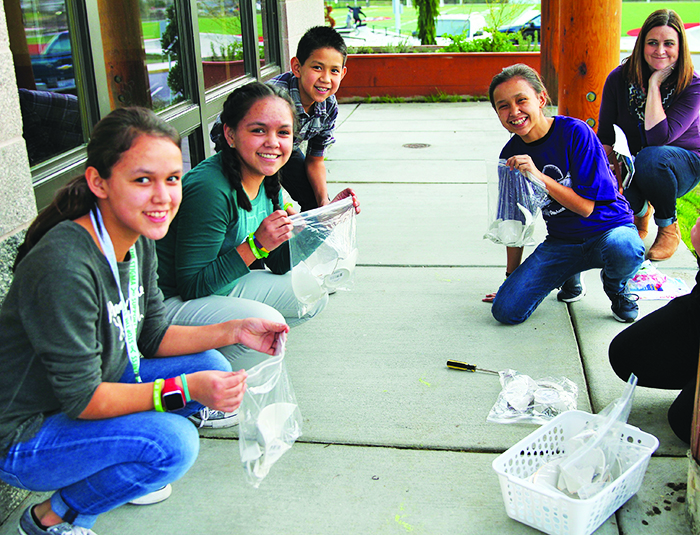 “With the recent creation of the Tulalip Special Needs Parent Association by several key community members and Youth Services, we wanted to honor the great work that’s going on by making sure that we create activities and places that are wholly inclusive of all youth,” explained Monica Holmes, C.R.E.A.T.E. Space designer and Parapro for the M.S.P.I. Grant. “That meant taking a look at our facilities first and asking the question: Are we accessible in every sense of the word to our youth with special needs be they social, emotional, physical or mental? “The C.R.E.A.T.E. Space has two major components that were developed to meet those needs. The Calm Room is a sensory inclusive space with various elements that can be utilized to provide a sensory environment which promotes a sense of calm and well-being, while addressing the individual sensory input needs of our youth with sensory overload challenges. We’ve stocked it with items like play dough, Legos, fidgets, soft furnishings, lower lighting, colored mood lighting, essential oil infusers, nature sound machine, yoga mats and resistance bands that can deliver the right amount of sensory input and/or relax the nervous system that is agitated or overloaded by typical lights and sounds of most spaces. For the grand opening event many Tulalip service departments were invited to setup their own information booths where they could interact with visitors to the Space. Community Health, Smoking Cessation, Problem Gambling, Chemical Dependency, and Behavioral Health were among those who accepted the invite. Partnerships are key in spreading awareness and resources to our community members. With all those services under one roof at the same time, they were able to let people know they have many choices and places to go for help with various addictions or issues. They also helped de-stigmatize the act of reaching out for help. 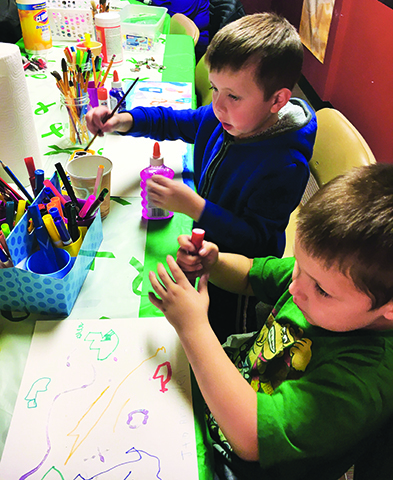 A variety of free expressive art classes were offered to visitors and attendees of the grand opening event. 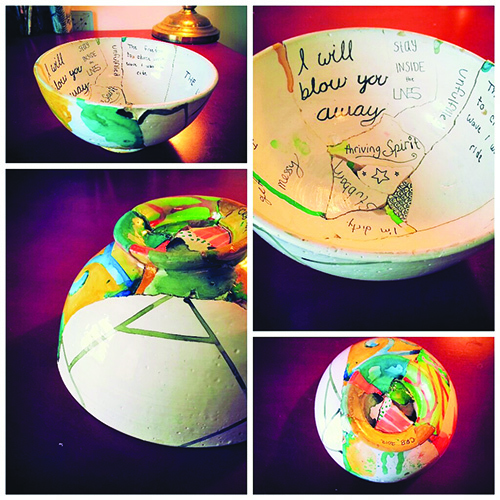 The one receiving the most youth attention and excitement was the Broken Bowl Project. The bowl represents us as an individual, we are vessels that hold many things. But sometimes we break and need to be put back together. Our brokenness changes us, makes us who we are. And so the painting on the outside of the bowl represents who we are on the outside, and the words on the inside of the bowl express all the hidden components that make us who we are. The C.R.E.A.T.E. 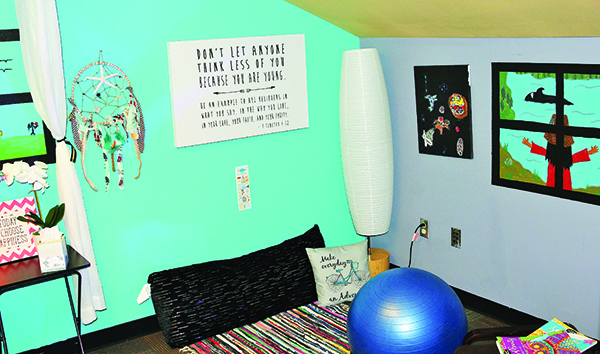 Space is a place to decompress and also learn positive coping skills with an adult who has been trained to provide sensory appropriate options during times of high stress and overload. 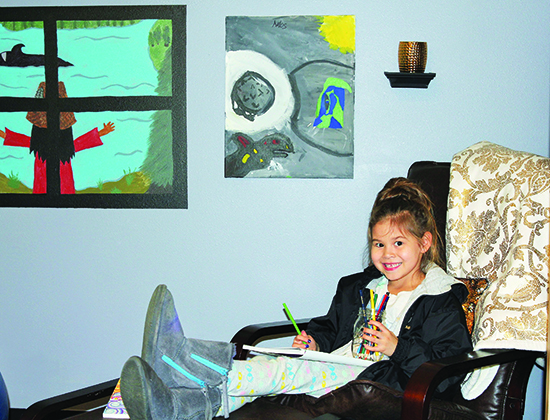 As the mother of four special needs children with sensory processing issues, Parapro Monica Holmes has spent years learning ideas from occupational therapists and creating spaces like this at her own home and in public settings for children. Mental health services for Native Americans took a 5 percent cut due to federal sequestration, and the reduction has cost tribes essential staff and programs, reports NPR. Native teens and 20-somethings are killing themselves at an alarming pace. For those 15 to 24, the rate is 3.5 times that of other Americans and rising, according to the Indian Health Service (IHS). Tribes have declared states of emergency and set up crisis-intervention teams. “People are overwhelmed. Sometimes they’ll say, I just can’t go to another funeral,” says Diane Garreau, a child-welfare official on the Cheyenne River Sioux Reservation, in South Dakota. But many of these mental health and suicide prevention programs are either being forced to scale back due to a lack of funding, or stunted and unable to expand to meet their community’s needs. The Oglala Sioux Tribe in Pine Ridge, South Dakota, for one, is now unable to hire two additional mental health service providers, Cathy Abramson, chairwoman of the National Indian Health Board, told NPR. • 1-800-273-TALK is a free, confidential 24/7 hot line for anyone who is in crisis about any issue and wants to talk to a trained counselor. You can also call if you know someone in crisis and want advice about what to do. • The U.S. Substance Abuse and Mental Health Services Administration (SAMHSA) administers youth-suicide prevention funds provided by the Garrett Lee Smith Memorial Act, named for a senator’s son who killed himself in 2003. The agency hopes that going forward more tribes will apply for them, says Richard McKeon, chief of SAMHSA’s suicide-prevention branch. • SAMHSA offers technical assistance, on grant-writing and more, through its Native Aspirations program (NativeAspirations.org) and publishes a prevention guide, To Live to See the Great Day That Dawns, available online. The agency also maintains a registry of evidence-based (scientifically tested) suicide-prevention practices. • For Indian Health Service resources, check the agency’s website. • Two nonprofits, the One Sky Center and the Northwest Portland Area Indian Health Board, offer much helpful information.